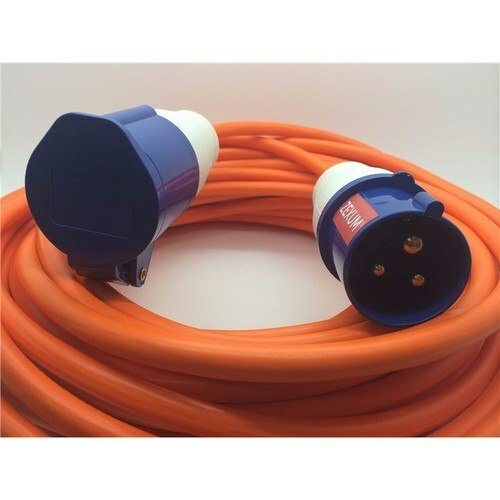 Made in the UK, High Visibility 16 Amp 230-240V Mains Orange Extension electric hook up cable Ideal for Caravan, Camping, Motor home, Marine and Boat as a Hook Up Power Cable due to its Tough and Durable Properties. Manufactured with High Quality, Tough and Durable 1.5mm 3 Core 3183Y Hi-Vis Flexible Orange Cable (16A Rated), BASEC Approved and certified to BS6500, CENELEC HD21.5, VDE 281 and BS EN 60228:2005 (previously BS6360). Orange Flex is recommended for Caravan and Camping uses due to its high visibility. Running a caravan site we use quite a number of hookup leads and extension cables and see a great many more. This one is first-class and an excellent one to go for. Proper 1.5mm cable, so can carry the full 16 amps with no voltage drop. Strong mechanically and well worth the slight difference in price as compared to lesser cables. Supplier and specification has been noted for future use and to recommend to our customers. can i use this on any campsite? Electrical World Replies: We would recomened contacting the campsite before you presume they will accept your cable rather than being disappointed when you get there. All our cables are manufactured to the highest standard and tested according but some campsites dont allow cables in case people bring in home made un tested cables. If you are still unsure if you bring a copy of your receipt of purchase which proves you bought this from us (a reputable seller) this should make your life easier if the campsite is unsure about your cable.